I wish I had been able to get a picture of it ON because the length is actually perfect on a living breathing person :) I also love my new necklace inspired by this apron. I got THIS gorgeous set of measuring spoons from Anthropologie a while back. I actually caught my husband using them the other day and warned him that he may want to stick with the plastic ones because if the anthro ones broke I would be super bummed. Then I thought how silly to waste something so pretty in a drawer. Since I am an avid baker I thought it would be cute to string it on some cute thread and make a necklace. First I tried the tablespoon but that was too big, and pretty heavy. 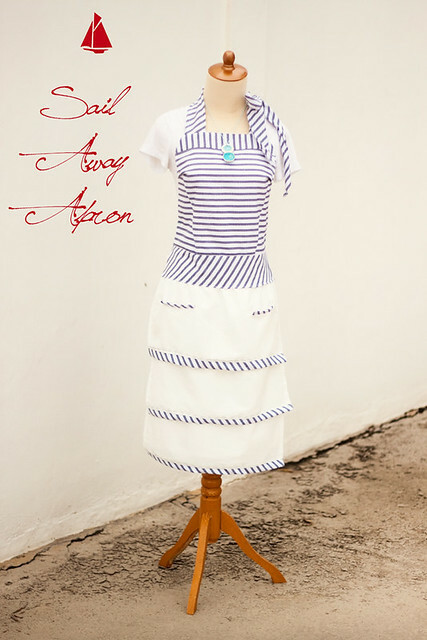 I might even downsize to the 1/2 a tsp :) In any event what is fun about this particular tutorial is there is a pattern for the top of the apron (found HERE) but you also get to stretch those sewing skills and follow a long to make your own tiered bottom of the apron. Shall we sail away? Make sure when you cut the waistband part of the apron you do so on the bias so that your stripes are diagonal. This makes a huge difference in the overall look and it eats up a huge amount of fabric too ha! Take your two side bodice pieces and pin them right sides together to the bodice main. When you do this you are going to overlap at the top so much that when flipped out you will BARELY be able to see the top of the "side bodice" piece. Sew along the raw edges on both sides. Once you are done flip the side pieces out and topstitch what you just sewed. Now take your neck ties and pin them about 1/2 an inch in from either side. Once you have both ties in place take your piece of plain white fabric and lay it right sides (um is there a right side?) down and line up the edges all the way around and pin in place. Once you have a rectangle hem up the bottom and both sides. Once done take one of your tiers and line the raw edges of your accent up with the raw edges (and right side) of your tier. Pin all the way along, then sew down the raw edge. Now in the place you would like one of your pockets to be cut a slit. Now repeat on the other side in the same locationish. Once you are down cut 2 small strips of stripe fabric that when hemmed will be the same length as your pocket opening. Now you are going to cut to squares ON THE FOLD that are the same length at the slit and as deep as you like. Now we are going to make a little fabric sandwich. Fold over the ends of your striped fabric strips. Now fold the whole thing in half. With right sides together line up the raw edges of your striped fabric strip and the raw edges of the bottom slit. Once lined up take one raw edge of the square you just cut and lay that on top lining up the raw edges. Pin in place. Sew across the raw edges. Then Flip the long square of fabric in the slit and topstitch what you just sewed. Now, flip the tier over so that the wrong side is facing you. Line up the top raw edge of the pocket with the other loose raw edge of your pocket square. Sew along the raw edges. When you are done sew up either side then tuck the pocket in. Voila! Place the second tier up higher but where it will over up where the first tier was attached. Now for the third tier, gather if you need to then tae your bodice top. Using a hot iron, iron in the bottom of the apron bodice so you make a little pocket of finished edges. Once done slide the apron bottom (lined up with the raw edges of the 3rd tier) in between the striped fabric and the white fabric. Pin all the way along. Topstitch all the way across making sure you are catching all the layers as you sew. And thats it!!! I hope the instructions were clear. I am trying hard to make the tutorials easier to understand and the patterns looking more professional but I am still learning! Now go sail away on a sea of frosting! I love it. It is my favorite so far. Thanks for taking the time to write up a tutorial and pattern for us. 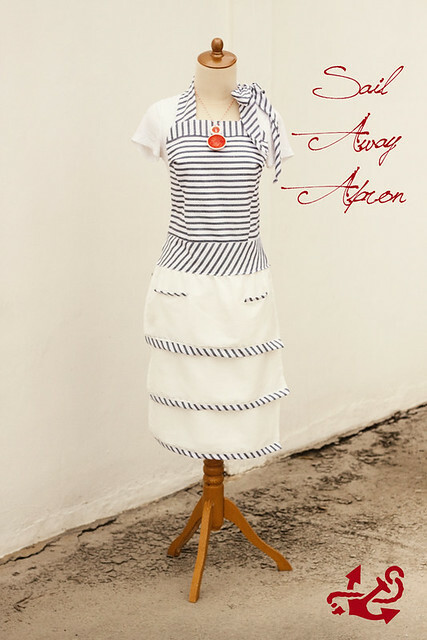 Absoutely adorable apron! Good job and great tutorial! This is lovely, and a wonderfully professional tutorial. That is gorgeous! I would be afraid to wear it and get it dirty! This is so great!! I can't believe you can figure this all out on your own. You're amazing! Thanks for sharing! Top of the Mornin' to yah!